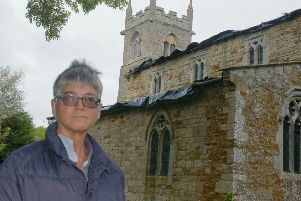 Here at the Melton Times we love to see and hear what our readers have been up to. And we know you really enjoy seeing pictures of your own events in the paper too - whether your club has received a generous donation, or you’re taking on a charity challenge. Graham Bett was out taking random shots of Melton Mowbray Town Estate parks when came across this rare sight in Play Close park. A young squirrel ran towards Matthew Long and refused to leave! Over the course of each year, we publish pictures of schoolchildren dressed up for Red Nose Day and World Book Day. We see Scouts, Brownies, Cadets and others winning awards, and we hear from clubs whose members have achieved something special. We hear about those readers bold enough to take part in skydives or impressive feats of endurance in aid of a wide range of charities. This is not to mention those of you who bake cakes, run stalls and volunteer to help your communities. And we see pictures of the charities, groups and clubs as they gratefully receive your hard-won cash as a result of those efforts. During the year, we know there will be a variety of fundraising fetes and shows and a number of club presentations taking place. So why not send in a photo and a brief report and we’ll do our best to let everyone know what you’ve been up to.